Naturally, for the RTS/CTS session we will need two SAE J1939 nodes. In my setup that means communication between the Arduino Uno and the Mega 2560 ECUs. 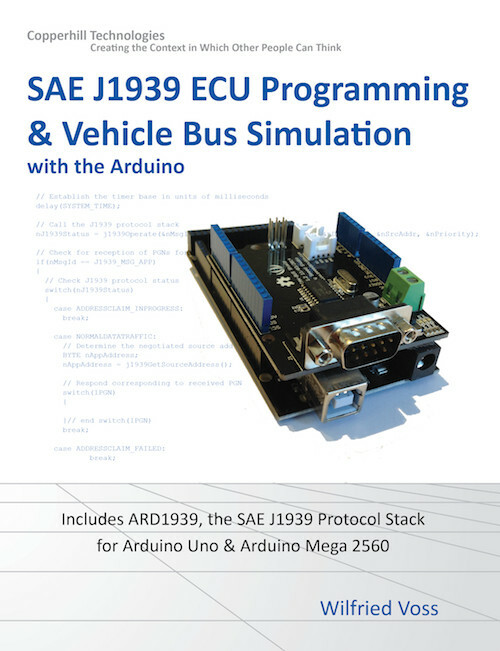 The SAE J1939 protocol stack is installed on both systems. The Arduino Uno has a preferred address of 0x80 (128) and an ECU instance of ‘0’. The Arduino Mega has a preferred address of 0x80 (128) and an ECU instance of ‘1’, which means, after the address claim process, the Mega 2560 will get 0x81 (129) as its source address. The Arduino Mega will send the 15-byte message (as copied from the previous example) to the Arduino Uno. Instead of sending the message to the global address (255), we will send it to the Arduino Uno’s address of 0x80. Line 2: The Arduino Uno responds with a Connection Abort message (note the first data byte = 255) and states that it’s lacking the necessary resources (see second data byte = 0x02). Note: The SAE J1939/21 Standard does not address all possible scenarios that may lead to a “Connection Abort” message. I deemed it necessary to provide a feedback when an RTS/CTS session cannot proceed. In this case, the reason is that the node has no use for the message. The ECU at address 0x81 (129) sends a Request to Send message to the ECU at address 0x80 (128). 0x1C indicates a priority of 7. 0xEC80 initiates the TP (Transport Protocol), meaning this is the TP.CM (Connection Management) PGN of 0xEC00 (60416) plus the destination address of 0x80 (128). 0xEC81 initiates the TP (Transport Protocol), meaning this is the TP.CM (Connection Management) PGN of 0xEC00 (60416) plus the destination address of 0x81 (129). The following 7 bytes are raw data.